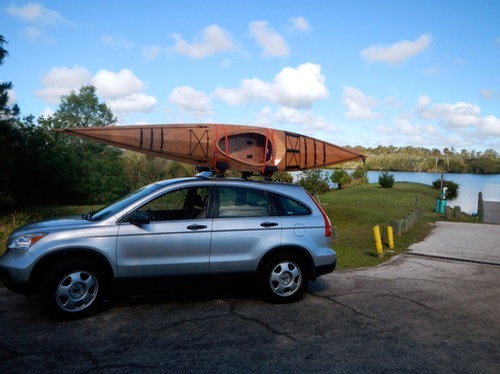 One of the issues for me in kayaking, even before my heart issue this summer, has been the difficulty I have getting my boats on and off of my small SUV. The three or four inch difference in roof height between this Honda C-RV and my old PT Cruiser is just enough to be out of reach without extraordinary effort from this vertically challenged senior citizen. While I may have help in loading and unloading my boat at the put-in, I don't typically have such help at home. 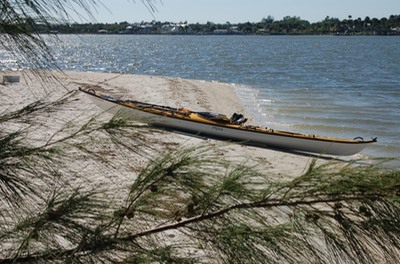 The result has been that I paddle less often than I might if loading and unloading my boats were easier. I have reflected on this problem on and off for the past six months. My initial thought was to look for a car with a lower roof line. But the five year old C-RV has been trouble free. I don't see anything else out there that seems any better, and I still would be lifting my sixty pound boat over my head onto the roof of the vehicle. So my thinking turned to thoughts of a trailer. There are several advantages to using a trailer. First, I would be loading boats at ground level. This would eliminate lifting the boat over my head, the need for a stepping stool to attach straps and the placement and removal of roof racks. Second, a trailer should be out of the wind stream, lowering fuel consumption costs. Third, I could carry two, three, even four boats on a trailer which would be a boon when setting up shuttles. 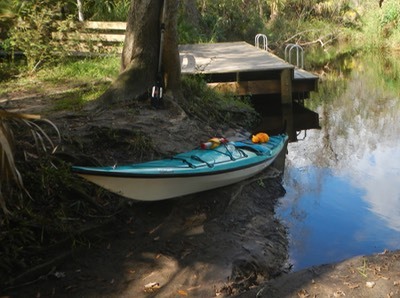 Fourth, this particular trailer is so light and well balanced that it can be handled much like a kayak cart in getting boats close to the water. The big disadvantage for me is the issue of storage. Florida houses are not known for their vast storage capacity. I have a two car garage. Lisa gets one side for her car. I get the other side for my work space. I park my car in the driveway. Our gated community does not allow for outside storage of trailers, so mine will need to go in the garage in my work space. This is a disadvantage and a consideration, but not a deal breaker. The only other disadvantage I can see is that I will need to learn how to back up with the trailer attached. I haven't tried this in forty years and I wasn't very good at it then. Hopefully practice will help. Or I can just disconnect the trailer and maneuver it by hand! 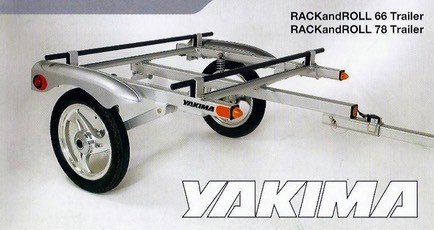 So, after all this rumination, I ordered a Yakima Rack and Roll 66 trailer. The Rack and Roll is an all aluminum trailer. 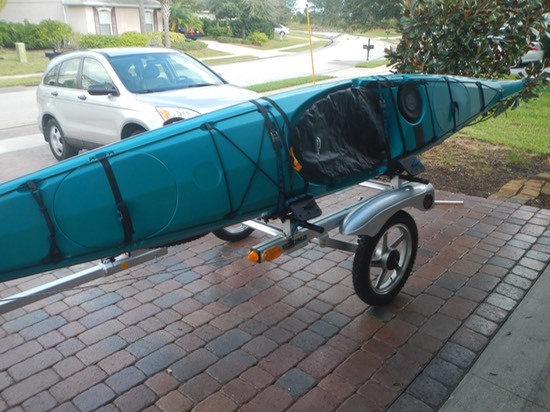 That makes it one of the more expensive kayak trailers. 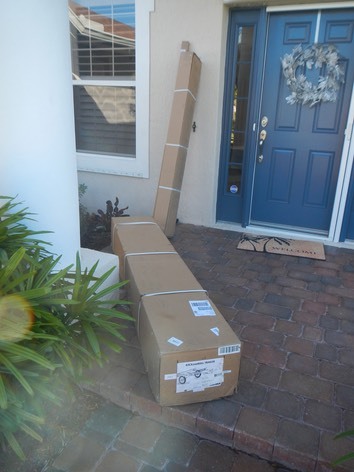 I ordered mine from OutdoorPlay.com and got it on sale for about $500.00 off list, plus no tax and free shipping. 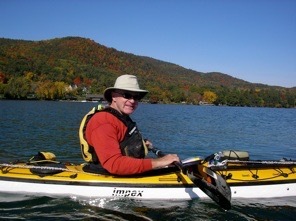 (OutdoorPlay is a membership site. Members get 15% off already reduced prices.) The trailer arrived in about six days in four big boxes. The video below is the story of its assembly. One comment on tools needed: You only need typical wrenches and screw drivers to assemble the trailer, with one big exception - a torque wrench. I didn't have one and wondered if I needed one. But I went to Home Depot anyway, picked one up and was shocked that it cost $75.00! However, It was easy to see that without this wrench I would have overtightened all of the nuts and bolts. Over tightening could cause them to fail. I recommend that you buy, borrow or rent a torque wrench if you try to assemble this trailer yourself. One problem as well: The trailer arrived in great shape with the exception of two electrical connectors. One was crushed and one had a wire pulled out. I managed to make a repair on these but wonder if the repairs will last. I will be contacting the company to look for replacements. I will be doing a review on the trailer's performance after I have used it for a while.